The superior image quality of RS80A with Prestige is built upon the successes of Samsung technologies. The S-Vision architecture together with features such as S-Harmonic and HQ Vision help deliver diagnostic confidence with even your most challenging patients. S-Fusion enables simultaneous localization of a lesion with a real-time ultrasound in conjunction with other 3D volumetric imaging modalities. S-Tracking increases the rate of accuracy during interventional procedures by providing the simulated path of the needle and the target mark in the live ultrasound image. S-Shearwave detects the velocity of the shear wave propagated through the targeted lesion and displays the numerical measurement of stiffness in kPa or m/s together with a Reliable Measurement Index (RMI). Arterial Analysis detects functional changes of vessels, providing measurement values such as the stiffness and intra-media thickness. The S-Vision beam former receives returning signals through a sophisticated digital filtering system resulting in reduced side lobes, less noise and artifact. With the S-Vision imaging engine, the digital signals demonstrate clear, detailed resolution and tissue uniformity. This new harmonic technology makes a clearer image near to far. Reducing signal noise, S-Harmonic provides more uniform ultrasound images. HQ Vision represents new, advanced technology for visualizing anatomical structures. With an improved image clarity both in the near and far field, it provides excellent image quality and helps to make a reliable diagnosis quickly. CEUS+ technology uses the unique properties of ultrasound contrast agents. When stimulated with low MI frequencies, the oscillating micro bubbles reflect both basic frequencies and harmonic signals. When doctors register CT and ultrasound scan images, there is always registration differences between them due to the respiration difference (inhale, exhale). 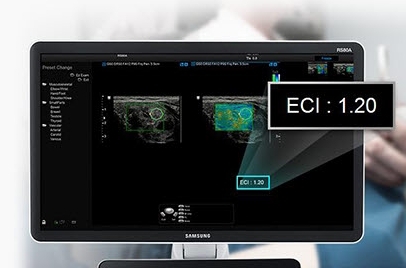 Samsung's Respiration Auto feature minimizes registration differences between the inhaled CT and exhaled ultrasound scan images by generating compensated exhaled CT image. Based on the available 3D data, S-3D Arterial Analysis helps measure artery plaque volume for quantitative analysis purposes as well as track morphological changes. This technology enables the early detection of cardiovascular diseases. Auto IMT+ is a screening tool to analyze a patient's potential risk of stroke and heart disease. It allows easy intramedia thickness measurement of both the anterior and posterior wall of the common carotid by clicking a button. Strain+ quantitatively displays a Bull's Eye which shows left ventricular motion and dyssynchrony at a glance. The Stress Echo package includes wall motion scoring and reporting. It includes exercise Stress Echo, pharmacologic Stress Echo, diastolic Stress Echo and free programmable Stress Echo. S-Detect employs BI-RADS scores for standardized analysis and classification of suspicious lesions. It provides the characteristics of displayed lesion and recommendation on whether the lesion is malignant by adopting advanced detection algorithms. S-Detect for Thyroid uses the advanced technology in detecting and classifying suspicious thyroid lesions semi-automatically based on Thyroid Image Reporting and Data System (TI-RADS) scores. E-Strain is designed to enable quick and easy calculation of the strain ratio between two regions of interest for day-to-day practice. Simply by setting the two targets you can receive accurate, consistent results and make informed decisions in many types of diagnostic procedures such as breast, prostate or gynecological examinations. E-Thyroid uses pulsations from the adjacent Carotid Artery and provides an assessment of thyroid lesions. EZ-Exam+ transforms multiple ultrasound investigation steps into a streamlined process. It enables users to build a fast and convenient diagnostic environment by storing optimized, preferred protocols with the EZ-Exam+ function control. Quick Preset shows the four connected transducers and, for each of them, the most frequently used image settings. With one touch the desired transducer and preset will be activated. 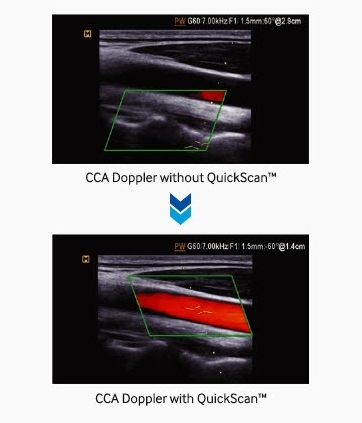 Advanced QuickScan technology provides intuitive optimization of gray scale and Doppler parameters. One touch of the QuickScan button elevates efficiency and workflow by adjusting functions including color gain and color box location. The 3D Natural Vue delivers a realistic view of the surface. It offers morphological information including form, size and location of the Region Of Interest compared to 2D images. The folding monitor enables safe and secure transport. The RS80A's 6 way control panel optimizes the work environment to reduce repetitive stress. Upon power down the control panel returns to home position for easier mobility.